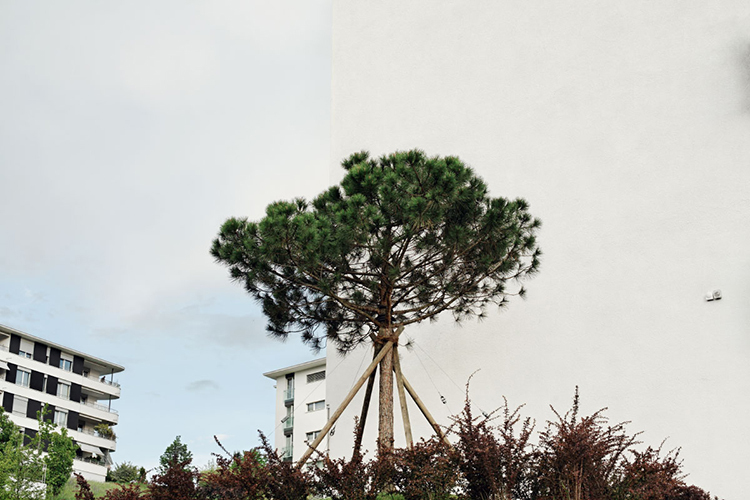 untitled, from the series "Périphérique"
In the project I brought together my passions for street photography and more formal documentary photography to analyse the border area of a modern, central-European city - Lausanne, Switzerland. The project investigates the counteracting forces of the stubborn and creative persistence of nature versus the unavoidable expansion of city-outskirts, carefully laid out by urban planning. This struggle is displayed through often metaphorically layered images which also shine a further light on the ambiguous way humans - both individually and collectively - deal with nature in the artificially created border environment. The Swiss in particular are an extremely organised people when it comes to city planning, which is visible in the confined and tame form nature is forced into. It appears that the constructed has not lost against the organic - yet. It is exactly that delicate, lingering determination that can be found woven throughout the fabric of the whole project. Despite the perfect execution, the busy-as-worker-ants expansion of our territory, there is a tangible feeling that the forces of decay and plant life are eternally stacked against us; just waiting for us to weaken, to slow our efforts - tired.